I started off more or less where I left off, in my preparations for the - ahem - Half Marathon in the Hague, with 8 lots of 2 minutes at my "vVO2Max" of 19 kph (3:10 /km). My back, which had very much been a limiting factor before, is in much better shape after a few weeks of relative rest and so the workout was not overly taxing. What did make the week a little more challenging was fitting in a quick trip to Mexico on Wednesday. The (12 hour!) flight left just after midnight on Tuesday night / Wednesday morning, I arrived to Mexico City at about 6am the same morning with the time change, went to the office after a (cold!) shower in the hotel, met up for dinner with a friend, had a breakfast meeting the next day and then caught the flight back at midday, arriving at 6am in Madrid (now on Friday) and going straight to work via a quick (hot) shower at home. The trip was such a whirlwind that we did the same there and back as the pane and its crew. All this made it difficult to find time to do any training - that, and the general lack of security is not exactly conducive to running in the streets. I did manage to get up nice and early on the Thursday - more than anything, to make sure that I'd be tried enough to sleep on the plane back home - and do a 40 minute run on the hotel treadmill. Remember that Mexico City is at an altitude of 2,400 meters... It was too much like hard work to run at my usual pace of 4:00 /km (15 kph) so I ran instead at 4:27 /km, or 13.5 kph which felt more or less the same. According to Jack Daniels' running calculator, the altitude counted for about 16 seconds per kilometer. 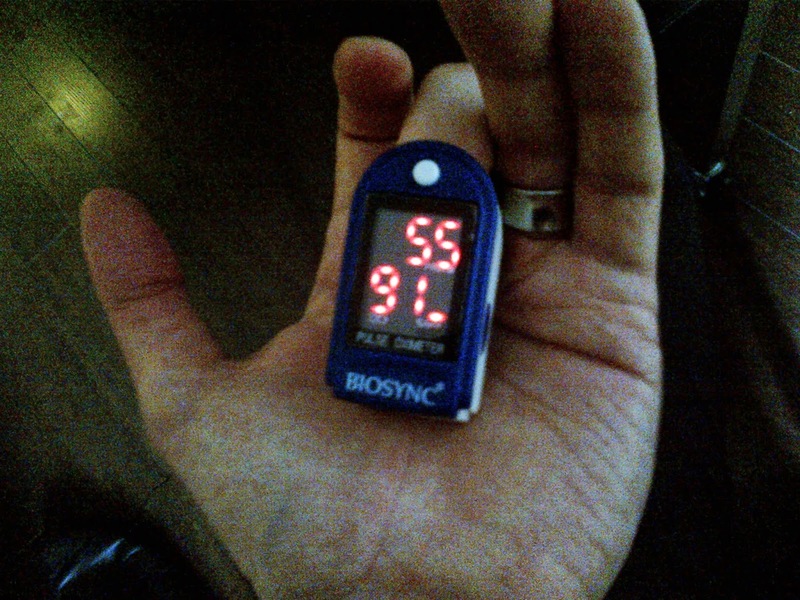 I recently bought another gadget: an oximeter, which measures the oxygen saturation in my bloodstream. The main reason for this was as a result of something I read in Steve Magness' book about Exercise Induced Arterial Hypoxema, a symptom that many elite and not-so-elite athletes suffer from, in which the oxygenation of the blood drops significantly during exercise, as the heart pumps the blood around the body so fast the oxygen doesn't have time to diffuse into the bloodstream. I took it with me, to see what effect the altitude would have. Normally, in Madrid at 600 meters above sea level, my reading is around 99%. Recently, I've been playing around taking measurements after running 40 minutes at 15 kph and finding that it drops down to around 95%. Before I even got on the treadmill in Mexico, however, the reading was down to around 90% and it didn't change much after exercise. The interesting thing would have been to see if the reading increased to 99% over time, and how long this process took. I would have liked to test some natives to see whether their readings were closer to the 99% mark but I limited myself to just testing my boss who gave more or less the same figure as I got. I was surprised at how well I coped with all the travelling - I didn't really notice any adverse effects except not being able to find where I had parked my car on Friday night. Last time I flew back from Mexico, I also remember being a bit groggy and ending up scratching my neighbour's car at work. Considering that I had done that maneuver literally thousands of times without once damaging anything, I can only put it down to jet lag.The rest of the week's training went by without too much ado but that is to be expected as I am starting off having rested quite well for the last couple of weeks. Soon the ever present fatigue associated with following a training plan will be with me again.